I love tombstones… that’s something creepy and well known: I realised that the majority of inscriptions I publish here are from tombstones, but that’s it. Tombstones are not only beautiful, but also a fertile source of information. Some Iranian tombstones, for instance, can be used to trace the history of craftsmen, or to better understand symbolism. This tombstone is kept in the Metropolitan Museum, New York (acc. num. 34.152). It is a beautiful alabaster slab, carved in Nishapur in the 10th century. The inscription is delivered in a plain kufic script, linear, with hardly any decoration. The text is framed in a two-dimensional niche, a feature that will be further developed in Iranian tombstones, particularly two centuries later, in the 6th/12th century. The gravestones of that period display a two-dimensional niche, where most commonly the name of the deceased and the date are inscribed. There, the niche is surrounded by inscribed frames, whose text is most typically Qur’anic. 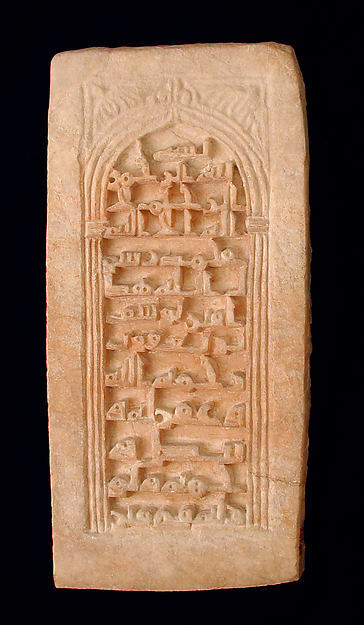 Back to this tombstone, it is quite clear that the architectural structure within which the text is inscribed is an image of the mirhab, as Khoury puts it in his article “The Mihrab Image: Commemorative Themes in Medieval Islamic Architecture”. But before going on considering the symbolism of the mihrab, it would be useful (and much fun) reading the text inscribed on the surface. may God be merciful to him / grant him pardon / and whiten h/is face, and il/luminate for him [his] grave. No date is given in the text, nor are to be found Qur’anic quotations, which commonly are included in funerary texts. Instead, the inscription contains four invocations to God, one of which is particularly interesting when set in the context of the two-dimensional niche. I refer to the last one: may God illuminate for him the grave (most commonly, his grave). The root of the Arabic word used is n – u – r.
The niche, the mihrab, in particular when represented as a two-dimensional form, is often decorated with a small lamp, according to this verse. The light is thus a symbol of God, to some extent. Also, in the verse, we can find a kind of eschathlogical message: God will guide to His light whom He wills. 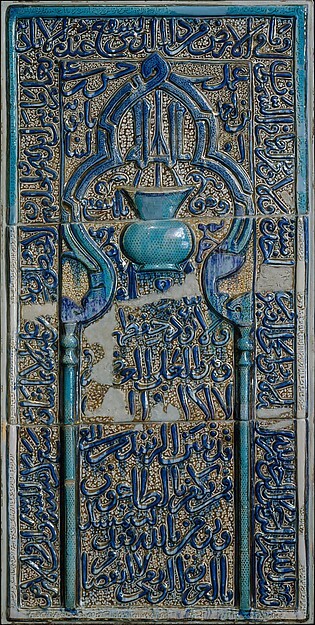 This verse, and subsequently the image of the mihrab is commonly connected to gravestones and shrines. What I think, is that the reference to the light of God upon the grave is not coincidental. We can consider the three themes (the niche, the light verse, and the invocation of light) all connected and perfectly in line with the subsequent tradition of gravestones that used and developed even further this connection between the Light Verse and the mihrab, related to a funerary context. What we see here is a symbolism which was most probably well understood in 10th century Iran: the connection between the Light of God and the mihrab did not require a clear image, it was simply hinted.